In ca. 1812, James Dinsmore and John Neilson replaced almost all of the windows on Montpelier's main block in order to unify and modernize the house. Prior to the ca. 1812 replacements, the windows dated from two generations with the wider windows on the south dating to ca. 1764 and the taller, narrower northern windows dating from ca. 1797. When President Madison had the windows replaced in ca. 1812 he was acting to assert that Montpelier was now one house and not the shared duplex he created with his father in ca. 1797. Montpelier's ca. 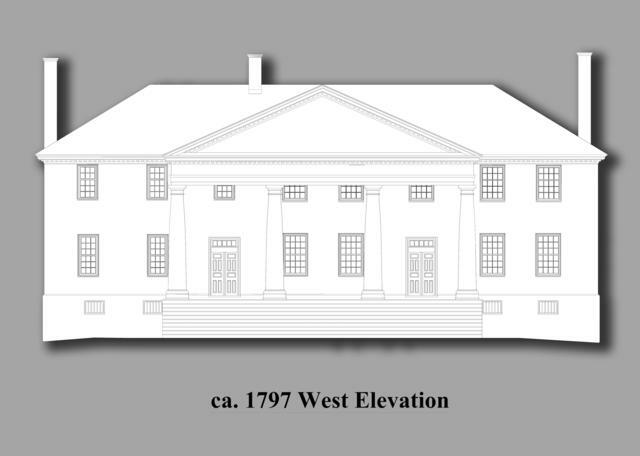 1797 West Elevation.